Oh, really simple recipe. I am sure you can use any sweet balsamic you have. If you don’t have sherry, wine will do. I mentioned the balsamic vinegar we purchased in November when we were in Napa in a post, Cranberry Pear. It is so good. I should have gotten the larger bottle. Anyway, this is a four ingredient recipe that has a lot of flavor. So yummy. I cooked it last night and I can’t wait to eat the left overs tonight! Pour the dry sherry in a baking dish (if the dish is large you might need more than 1/2 cup – you want at least 1/4 of an inch in the bottom of the dish) arrange the pork in the dish. Pour a little of the vinegar on top of each chop, then sprinkle each chop with lavender salt. Let sit for 15 minutes (longer if you have the time). After 15 minutes, repeat the process of pouring some vinegar over each one and salting. Let sit for 15 minutes (longer if you have the time). Preheat oven to 375° F. Put the dish in the oven for about 10 minutes. After baking the pork for 10 minutes take the dish out and turn each chop over. Sprinkle with more lavender salt. Then put the dish back in the oven for another seven minutes. These were simple and delicious. I love using balsamic as a marinade for meat. I think it pairs very well with pork. Usually I marinate the meat for longer, but I didn’t this time, but they came out great. 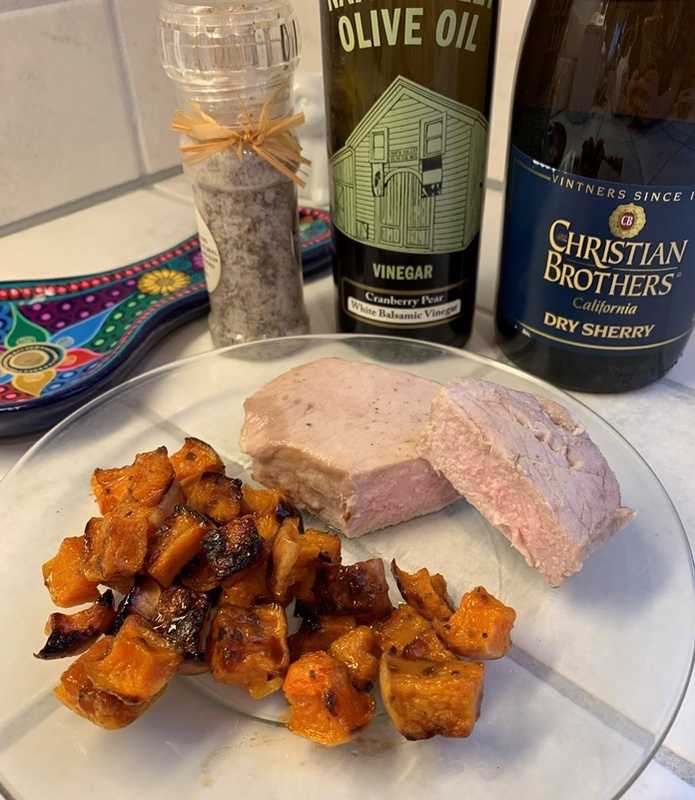 Do you have a sweet balsamic you like to pair with pork? Do you have a favorite balsamic?